Joined the Chiswick practice in 1982, became Principal in 1991. 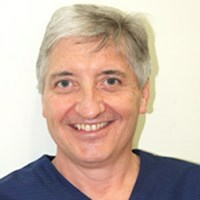 Previously Associate in West End practice, owned Harley Street practice until 2001, then joined by Dr Marnitz as a co-Principal in 2001. Interests:- Cosmetic dentistry including veneers, ceramics and tooth whitening. Advanced restorative dentistry, including surgical placement of implants. Treatment of nervous patients.